In this section we explore the road towards a Global Territorial Agenda, with the SDGs and the New Urban Agenda as important milestones. We include a provocative proposition to evolve towards a dual territorial planning system for a) the urbanized one half of earth and b) the non-populated other half of earth. While rationally thinking people and their governments largely support the United Nation’s Climate Change Agreement signed in Paris in 2015, we still have a long way to go before a similar deal will be agreed to reduce and reshape the human impact on mother Earth’s amazing territorial crust, both on the habitable and the ‘less-habitable’ territories (such as oceans, deserts and mountains). 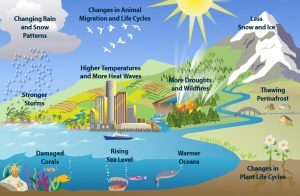 When we talk climate we all understand there are no strict boundaries except of broad (fluctuating) climate zones. 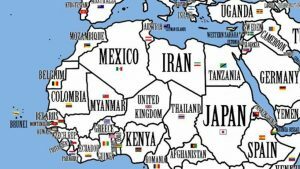 Yet, when it comes to territories we tend to tie our minds and actions within new or historic man-made boundaries of kingdoms, caliphates, states, cities and other administrative entities. Each of these territories claim ‘uniqueness’ as their ‘raison d’être’. 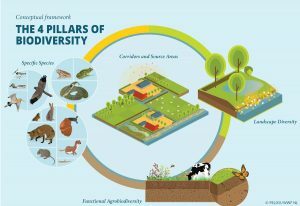 While we embrace the concept of multicultural diversity as part of the planetary biodiversity, this cannot longer be claimed as a reason to spill earths limited resources, including land. In effect, inter-cultural cooperation and universal territorial principles are required to avoid further critical loss of biodiversity. The first global action to reverse rapid breakdown of our planetary eco-system appeared under the label of ‘sustainable development’. But by distinguishing economic, social and environmental pillars of sustainable development, no explicit reference was made to ‘territorial development’ – on how this should impact where and the way we build and live on mother Earth’s fragile land crust. 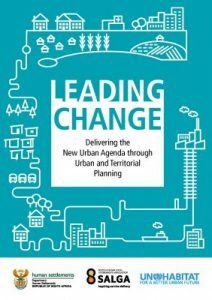 Possibly inspired by the ground-breaking HABITAT II UN Conference on Human Settlements in Istanbul in 1996, at the doorstep of the 21st Century ‘Urban Age’, we witnessed a growing awareness and policy focus on ‘urban challenges’ as a more territorial lens than the traditional sectoral approach. 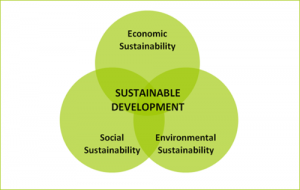 This culminated in the unanimous adoption by the United Nations of the Sustainable Development Goals 2030, including SDG11 on sustainable urban development – click here for more on the SDG’s from a territorialist perspective. AND YET, while the ‘urban focus’ can be considered as a defining territorial lens, there is a risk that non-urban territories will be carved up by too many competing sectoral policies and goals – not least by the ‘urban sector’ as reserve land for horizontal urban growth – the sprawl cancer. A strong ‘urban policy’ can only function in combination and harmony with a ‘contramal’ land policy including rural and natural territories. 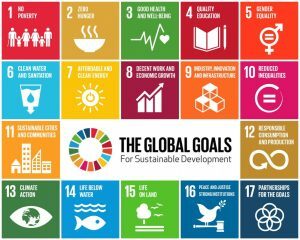 While its certainly justified to welcome and further explore the SDGs and its transformational agenda, we should not be blind for its shortcomings and maybe even ‘system-errors’, especially given the premises of continued economic growth as engine to eradicate poverty and ‘save the planet’. 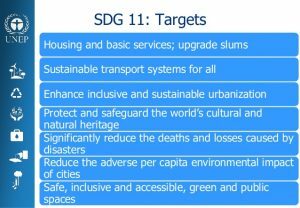 The same could be said about the new UN Urban Agenda as a mean to operationalise SDG11 and related goals – click here for more background on the New Urban Agenda. HOWEVER, – and anticipating a more extensive exploration further on – the 2016-2036 UN Urban Agenda is nothing less than the foundation of the ‘Global Territorial Agenda’ we need to reintegrate the human kind into the planetary biodynamics, with a balanced urban and non-urban global normative policy framework. As far as human planning skills could be of any help in achieving this overarching goal – and of course they do! 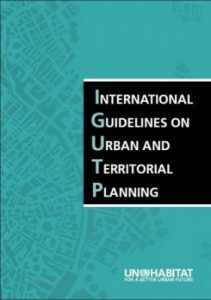 – the International Guidelines for Urban and Territorial Planning (IG-UTP) already provide an excellent roadmap to get there – click here for more on the IG-UTP, as well here for TCi’s infographics on the 12 Guiding Planning Principles of the IG-UTP. While the IG-UTP provide a strong tool to implement the NUA, the NUA provides a strong catalyst to apply and implement the Urban SDG11 and related (territorial) SDGs. This was further explored at the 9th World Urban Forum in Kuala Lumpur, Malaysia, which was entirely dedicated to the implementation of the NUA – for a TCi report on WUF9, read here. 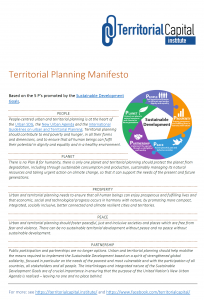 Both contemporary planning manifesto’s clearly express the need for an integrated territorial approach, across the urban-rural-natural continuum. 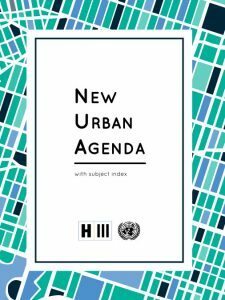 For that matter, the Urban SDG and the New Urban Agenda will need to morph into a more integrated Global Territorial Agenda (GTA) – despite the more catchy ‘urban’ label of the NUA. Nevertheless, the combination and integration of the three sets of UN-Habitat Guidelines on urban and territorial governance and planning provide powerful tools to contribute to global and local development goals, policies and strategies in both developed and developing countries and cities. TCi aims to further boost the application of these Guidelines by framing them within the Theory of Change (ToC) and Result Based Management (RBM), to break with the ‘business as usual’ and induce and conduct the change needed for a more sustainable urbanisation and human development – go here for more on ToC & RBM. In the following sections TCi explores the TOOLS we have and need to implement the SDGs, NUA and IG-UTP – within the spirit of a more balanced and integrated ‘Global Territorial Agenda’.